This week we've been taking in the awesome street style at fashion week in Sydney, and if there's any trend that we've seen emerge this year on fashionistas left, right and centre it's the bomber jacket. Paired back with a floaty dress, or sleek skinnies and a plain white tee, it's one of the most versatile staples for the upcoming cold season. Here are our picks for the best 8 bomber jackets on offer right now. If you're looking to kill two birds trends with one stone, this Topshop bomber is your new best friend. Badging has been all over the runways, and street style stars around the world are embracing the micro-trend. Contrast the toughness with a floaty slip in complementary colourways, and add an ankle boot for winter. 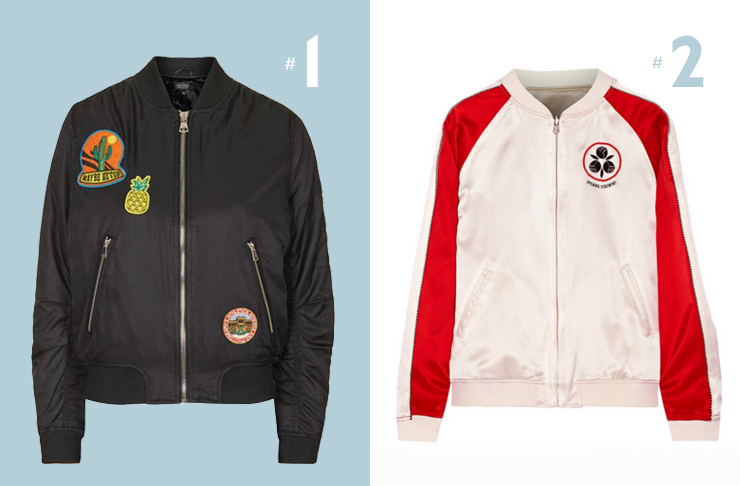 This reversible embroidered silk-satin bomber jacket is equal parts ironic retro chic, and Margot from The Royal Tenenbaums at a tennis lesson. Get it from ShopBop now—it's already sold out at Net A Porter. If you want a classic, Cue's got your back this season. This midnight blue, zip front, gathered bomber also comes in black, and is the best way to enter the bomber market if you're an understated kind of fashion girl. Who said black and blue don't go together? My personal favourite at the affordable end of the spectrum, this basketball-style bomber from FshnBnkr is a classic go-to for the tomboys out there. Style with bed hair, Ray Bans Clubmasters, and a bad attitude. 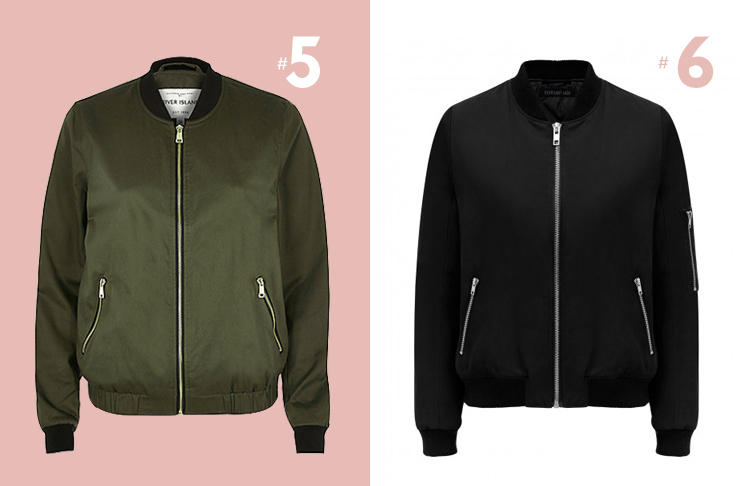 The one colour that has dominated the bomber trend in 2016 has been khaki, without a doubt—so this River Island gem is the perfect way to embrace the call. Monoblock with a matching khaki number underneath, or add a sleek LBD and heels for the coolest cocktail outfit this side of NYC. For $109.99, this Forever New bomber is the easiest and cheapest way to dip your toe in the bomber trend—perfect for those looking for a great basic option that has legs for a few seasons. Pair with black ripped denim and some Acne pistol boots and no one will be the wiser. 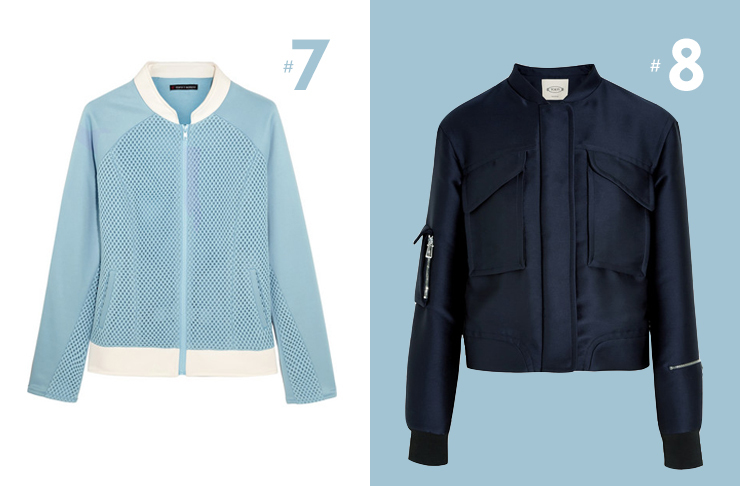 If you want to indulge in a bomber this season but you're more of a Kate Middleton than a Rhianna, this Perfect Moment number is the bomber for you. The sweet powder blue and white take on sport luxe works just as perfectly back with a tee and jeans as it does with sleek activewear for a weekend brunch.